We already talked about the risks involved in towing large trailers and how important it is to take the necessary precautions in order to avoid having a disastrous accident. Today, we are going to cover one of the most important safety measures for towing any type of cargo. Trailer safety chains are a crucial part of your towing equipment, in fact, when on the road, you are even legally required to have them attached to your trailer. We’ll go in-depth on the topic of why you want to have them at all time, how they can prevent accidents, and how to properly attach them. This type of information can keep you safe on the road, so read along. The primary role of hitch safety chains is to act as a backup security measure in case your trailer hitch and ball mount malfunction and separate. Properly attached chains will give you enough time to react and slowly bring your vehicle to a stop without the trailer drifting away and crashing into the traffic behind you. Safety chains are much more than a mere accessory. They are an essential piece of equipment that can prevent a family field trip from “going south.” That being said, it is crucial that you check if your safety chains are properly hooked up before you hit the road. So, you’ve finished planning your trip, and you’ve decided to bring your trailer with you. Before you leave your backyard, do a quick walk-around and inspect your vehicle and equipment. When checking your trailer safety chains, you want to take a closer look at all the links individually, and be sure they are not damaged. Check your S-hooks and make sure they are hooked from the back side to ensure they don’t fall out. Check all the bolts on the hitch and make sure it’s screwed in tight. Hooking up the chains correctly involves crossing them underneath the tongue. That way you ensure that if the vehicle and trailer separate, the chains will catch the tongue of the hitch, preventing it from falling directly on the road. The size of the chains you want to use will depend on the type of truck you drive and the weight of the trailer you’re pulling. They are categorized by class, where Class I chains are meant for pulling trailers that are 2,000 pounds GTW, Class II chains are for 3500 pounds GTW, Class III chains are for 5000 pounds GTW, and so on. They are usually made of heavy-duty metal, designed to withstand wear and tear in the toughest of weather conditions. When choosing the length of the chains, you want to make sure they are not dragging on the ground. The chains should be short enough to keep the trailer attached in case of an emergency, but also loose enough to allow easy maneuvering of the vehicle and trailer. We hope this article helped you understand why it is crucial to have your trailer hitch safety chains correctly hooked to your trailer. 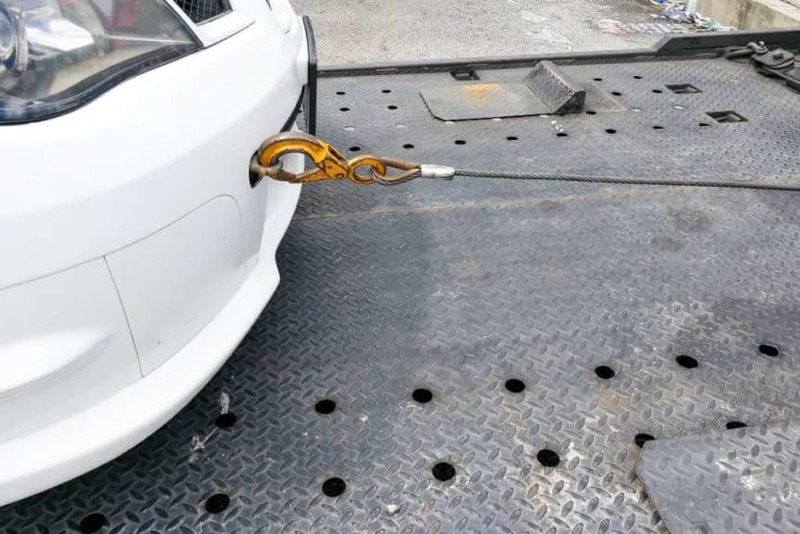 If you’re interested in more road safety tips or general tips on towing, feel free to browse through our blog section. Phoenix Towing is available for all your towing needs in the Phoenix Metropolitan area, so don’t hesitate to give us a call!